As I exit the bus from the airport my weary eyes stretch to attempt to adjust, not to a new light but new sights. My ear drums dance as they struggle to understand the sounds that they hear but are unfamiliar with. My nose begins to tickles as it’s sensors are struck with sounds they have not had the pleasure – or displeasure – of smelling before. The driver of the tall green double-decker lifts the air brake causing an emphatic shushing sound before he moves the bus revealing to me my home for the next few days: a hostel. Tired from the bumpy sleepless overnight flight over the Atlantic I take a deep breath and reach down to pull up the lever of my rolling bag. I glance quickly to my right and take a long step down from the curb and into the street. A car whizzes by from my left, blaring its horn and swerving to miss me just at the last minute. I can almost hear the driver’s cursing words, and can imagine his or her hand signal out the window. Culture shock is something that nearly everyone goes through when visiting to an unfamiliar part of the world. In fact, it’s something I’ve gone through before (read my article on reverse culture shock). However, as someone who has travelled the world for three years straight and over his life time has been to all continents save for Oceania, getting culture shock in Dublin borders on embarrassing. Perhaps the most confusing part is the fact that just a week before arriving in Dublin I spent a week feeling completely comfortable in Port au Prince, Haiti. I walked through the roughest neighbourhood in the city, and perhaps the western hemisphere, being chased by children and called the crazy white man just for being in the neighbourhood by others, and felt completely at home. However, the narrow sidewalks, the cars driving on the wrong side of the road, and the tight spaces of Dublin was driving me mad. For the first day I attempted to play it off as jet lag, assuring myself that it was a lack of sleep and change of time zones that had caused my skin to feel uncomfortable to wear and how even ordering a pint in my native tongue felt like the most foreign mission. I’ve never felt more out of place in my life despite the fact that I was often mistaken as a local and ask for directions from other tourists a number of times. “How have I become so helpless” I think to myself as I open my handful of coin to the supermarket clerk letting her draw the correct change because she couldn’t take watching me try to figure out the value of each gold piece any longer. I wish it were just jet lag. For weeks, and even sometimes to this day a month after landing in Europe, there have been times I’ve felt like puppy in a strange house. I spend my days trying to find light switches, trying to figure out locks, and dozens of other mundane everyday tasks that have somehow challenged me. However, at a point I realize that the puppy would not simply crumble to the new environment that surrounded him or her, he or she would explore the hell out of it. They would race around hoping to discover new things to play with, new places to play in, and of course more ways to cause havoc on the newly discovered toys and places. The world is a jungle gym, and although I expected that it would be Africa that would bring me challenges, it is the playground that I didn’t expect to that hit me like a tonne of bricks. But, at the end of the day, I’ve decided to take the lead of the puppy and learn from this experience, discover the unusual and uncomfortable, and take the opportunity to realize that each challenge is another opportunity to grow. Europe, I’m sorry, but you’ve become the newest chew toy of this travelling puppy. Weird how culture shock can come when we least expect it. Glad you’re enjoying the time in Europe…Chew away! Thanks D.J. – It can definitely toss you a curveball every now and then can’t it!? Ha ha! I totally understand the other side of the road thing, even after living away from the UK for over 5 years I still look to my left when crossing a road and am surprised to find cars coming from my right (worrying as I am now actually driving on the ‘wrong’ side of the road regularly…). Hope Europe starts to feel less alien to you soon! Brit – I guess you never listened to your mom when she told you to look both ways before crossing the road either eh? Enjoy it, feeling lost helps you find yourself, you could always try having a few more pints to make you feel at home! Love you photo’s. Very true points Rob, I couldn’t agree more. It’s definitely harder to make sense of cultures where you look like you fit in. I felt a bit like this in Amsterdam last year, whereas in Sri Lanka – no problem. 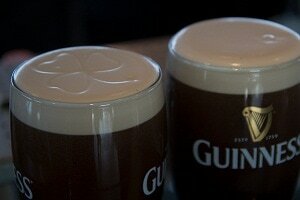 @Val – mmmmmm Guinness. Although I have to say I’ve started to drink a lot more cider lately! Interesting article. You should have enjoyed and be amazed at your culture shock experience. Thanks Rashmi, any experience is a good one, even if it is very strange. This is a refreshing take of Ireland, because traveling the UK and the rest of Europe is not easy. Everything is still completely foreign even though its an English speaking country, you have a right to be culture shocked darn it! Thanks Elise, I’m glad you liked the article. Culture shock is a tricky beast and it can jump out at you just about anywhere. I’ve often experienced culture shock in some ‘odd’ places. I figure it’s partly due to the fact I’ve often let my guard down a little or I’ve underestimated a place/location. @Sam – Culture shock hits us all differently. Especially guys like you and I who are used to travelling to the less touristed areas of the world.